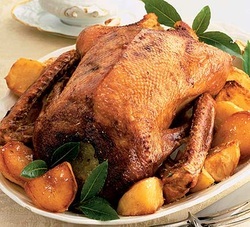 FREE RANGE GEESE AND TRADITIONAL BRONZE TURKEYS REARED ON THE FARM AND FED ON CORN GROWN ON THE FARM. IT IS HARVEYS JOB TO REAR THE TURKEYS (AND GEESE) WHILST ASHLEYS EXPERTISE IS TO PRODUCE THEM FOR THE TABLE, HUNG FOR FLAVOUR AND TENDERNESS WE BELIEVE OUR TURKEYS ARE THE BEST! CHOOSE FROM THE TRADITIONAL OVEN READY, BONED AND ROLLED, CROWN OR LEG, YOU CAN HAVE IT STUFFED, AS IT COMES, OR PREPARED HOW YOU WANT IT, WITH SIZES FROM 10lb TO 50lb! TRADITIONALLY PREPARED, THERE'S NOTHING INTENSIVE ABOUT OUR WORK!! EACH ORDER IS INDIVIDUALLY ASSEMBLED TO BY ONE OF OUR TEAM, ENSURING YOUR CHRISTMAS DINNER WILL BE THE TASTY TREAT YOU ARE HOPING FOR! 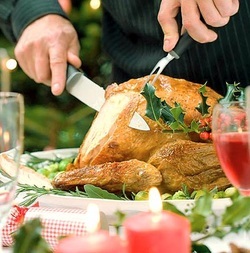 AS WELL AS FREE RANGE GEESE AND BRONZE TURKEYS WE OFFER A RANGE OF CHRISTMAS JOINTS OF BEEF, PORK OR LAMB. WE CAN PROVIDE LOCAL GAME AND DELICIOUS HOME CURED HAM OR BACON FROM OUR OWN OLD SPOT PIGS, SAUSAGE MEAT AND CHIPOLATAS. LARGE OVEN READY CHICKENS AND DUCKS ETC. PLEASE CALL TO DISCUSS YOUR REQUIREMENTS, FROM A SEVEN BIRD ROAST TO A DOZEN EGGS WE ARE HAPPY TO HELP! HOW BIG A TURKEY DO YOU NEED? WILL MY TURKEY FIT IN MY OVEN? Pre-heat the oven to 230°C/450°F/Gas 8. Cook your turkey at this temperature for the first 30 mins (or for the first hour for birds over 5kg) and then lower the oven temperature to 190°C/375°F/Gas 5 or 170°C for fan ovens. Total cooking time will be approximately 30-35 mins per kg. Please see tables below. foil and turn the bird over so the breast bronzes. For a 2 - door Aga, follow the cooking times above using the top roasting oven only. For a 4 - door Aga, follow the cooking times using the top roasting oven for the first 30 minutes (or for the first hour for a bird over 5kg) and then move to the baking oven for the remainder of the cooking.